Frankfurt Airport (FRA), or Flughafen Frankfurt am Main in German, is the entry point for many visitors to Germany. It is Germany's busiest airport and the fourth busiest airport in Europe (13th in the world). It is the main hub for Lufthansa as well as Condor, and a major transfer point for domestic and international travel. Whether your destination is the city of Frankfurt or another destination in Germany, Frankfurt Airport will help you get there. Frankfurt airport is located on over 5,000 acres of land and has two passenger terminals, four runways and extensive services for travelers. Almost 65 million passengers a year travel through Frankfurt Airport each year from 300 destinations, making it the airport with the most direct routes in the world. At Frankfurt Airport, there are shops and restaurants - many open 24-hours. The Airport City Mall (located in Terminal 1, departure hall B) has national and international retailers, supermarket and several restaurants. Wifi is free and unlimited. Cash machines, car rental, a casino, hair dresser, laundry, lockers, spa, pharmacy, post office, yoga room, and conference centers are also available. Smoking is only allowed in the 6 smoking lounges. A Visitor Terrace allows you to leave the enclosed walls of the airport and watch the planes (Terminal 2; 10:00 - 18:00; €3). There are kids' play areas located throughout the airport. If you want to sleep, the airport is safe and ample seating means you should be able to find somewhere fairly comfortable to pass out. Concourse B is open 24-hours and showers are available for a small fee. Frankfurt Airport has two main terminals. There is also a smaller dedicated First Class Terminal used exclusively by Lufthansa. Terminal 1 is larger and older. It houses concourses A, B, C, and Z. It is split into three levels with departures on the top floor, arrivals and baggage claim on the ground floor, and transport level below. Flights to non-Schengen destinations depart from the Z gates and Schengen flights depart from the A gates. Terminal 2 is the more modern terminal. It houses Concourses D and E.
The terminals are connected via free Skyline shuttle trains (it takes 2 minutes from one terminal to the other). A third terminal is currently under construction with a planned opening of 2022...although considering the uncertain fate of Berlin's airport this timeline may fluctuate. 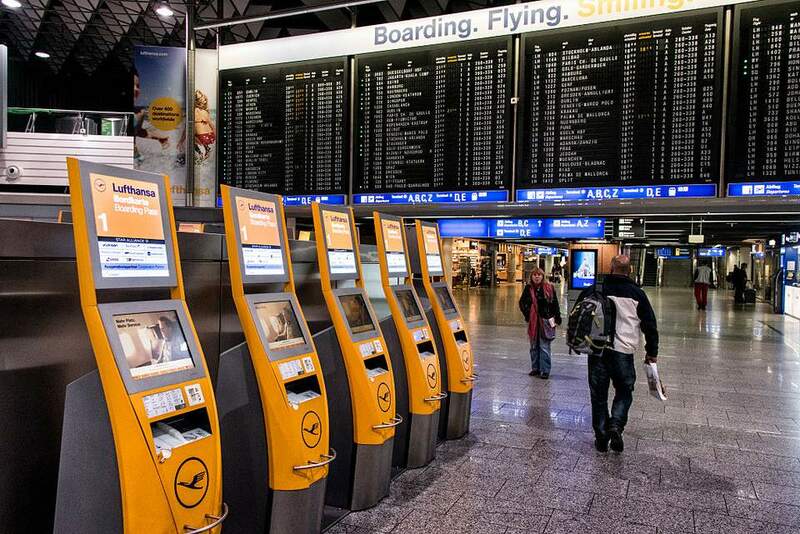 Check current arrivals and departures at Frankfurt Airport. The airport is located approximately 7 miles (12 km) southwest of Frankfurt's city center. The area surrounding the airport is included in its own city district of Frankfurt, named Frankfurt-Flughafen. The airport offers helpful transfer maps. Frankfurt Airport has two railway stations, both located at Terminal 1. The Airport Regional Railway Station offers metro, regional and local trains; you can take the subway lines S8 and S9 into Frankfurt's city center (approximately 15 minutes) or to Frankfurt's central train station (approximately 10 minutes). The Airport Long Distance Railway Station is right next to Terminal 1, with high speed intercity trains (ICE) leaving in all directions. Arriving railway passengers can check in right at the train station for about 60 airlines. Taxis are available outside both terminals. A cab ride into Frankfurt's city center takes approximately 20 –30 minutes and costs about 40 euros. Rates are based per car, not per passenger, and there are no extra fees for luggage. If you go from Frankfurt to the airport, just tell the cab driver your airline, and he will know at which terminal to drop you off. The airport is well-connected by the Autobahn as it is close to Frankfurter Kreuz where two busy motorways, A3 and A5, intersect. Signs in German and English clearly mark the way to the airport and to the different areas. There are multiple parking garages and even women's only spaces for safety. Read more about renting a car and driving in Germany. There are 25 hotels in and around Frankfurt International Airport – most of them offer free shuttle to/from the airport or are in walking distance from the terminals.